Bone broth is an incredibly healthy addition to not only the paleo diet, but any diet. It’s no secret that we all want to be healthy, look and feel good, and have a high quality of life. We live in a world where everybody is looking for the “miracle” that will help them with their clean eating habits – to become healthy and lose weight. There are all sorts of “short cuts” to help people achieve their health goals, but you and I both know that these short cuts don’t really work in the long run. It appears that bone broth is the next big thing and can give the benefits we’re all looking for. Best of all, it’s a nutrient rich food that anyone can afford to add to their diet! Never heard of it? Here’s a closer look at bone broth and its benefits – some information behind the craze. Bone broth is a broth that’s made using bones and water. In order for it to become a broth that is flavorful and beneficial, the bones must be cooked at a very low temperature for quite some time. The bones are put on a low-simmer for up to 24 hours – sometimes longer. The longer they simmer, the more gelatin is produced from the collagen-laden joints and the release of trace minerals found in the bones increases as well. 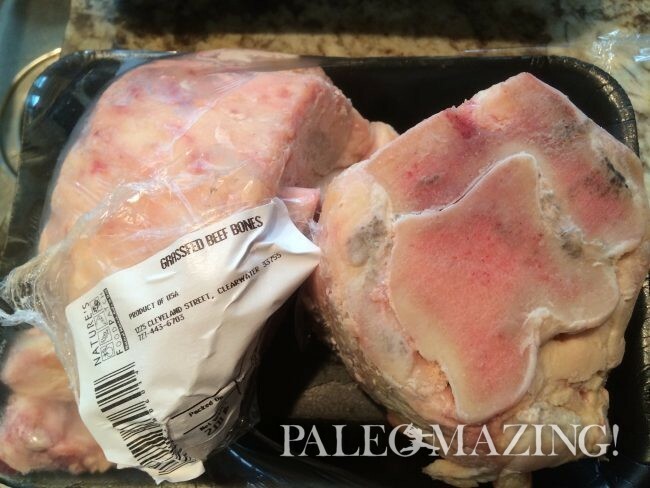 Will any part of the beef bone do for bone broth? Essentially yes, but you really want to stick with animal knuckles and thick leg bones; the knuckles contain more cartilage and collagen. You want bones that have marrow in them – ones that are considered ideal soup bones. If you mix different animal bones together, you’ll alter the flavor. I feel it is best to stick with one animal per bone broth to achieve the best results. Bear in mind that, when you create your broth, you should add in vinegar as it helps to leach out the minerals from the bones. Apple cider is ideal to use, as white vinegar will leave behind a harsh flavor. It’s important to understand that not all bone broths are the same. The best bone broths for people who are striving to be healthier, or those on a gluten free diet or paleo diet are the bones that come from grass-fed cows or free-range chickens. Now, you may be asking why that is. What it boils down to is that free-range chickens and grass-fed cows retain a lot of their nutrients. They don’t contain harmful toxins, additional hormones or antibiotics that chemical-fed animals tend to contain in their bodily structure – the full make up! Remember the old saying, “You are what you eat”? It completely applies to bone broth. People of the past would use the entire animal to stay healthy. They would eat organs and bones – much of which is thrown out today. Today, people see these parts of the animal used in dog food. Did you know that men of the past would give bone marrow and organ meats to pregnant or women of royalty because of their nutrient-rich revitalizing power? Interesting, right? Makes us think a little differently about how we eat meat and how we can take advantage of it to be as healthy as we can. Why Are Bone Broths So Beneficial? There are a plethora of benefits to bone broths that both men and women can get from using it. What are some benefits of bone broth that would improve men’s and women’s health? Anti-Aging Properties – Bone broth is loaded with collagen and hyaluronic acid, which helps the body inside and outside. Your cells benefit from the broth and, in turn, your skin. Both the acid and collagen will hydrate the cells and skin to soften the skin and keep the cells nourished. The broth can reduce the signs of aging. Joint and Muscle Protection – Animal bones contain magnesium, phosphorus and calcium, which are released into the broth and are necessary for building healthy bones. They also contain cartilage, which is loaded with collagen, chondroitin sulfate and glucosamine – nutrients doctors will prescribe in supplement form to people looking to maintain healthy joints. All of this means healthy bones, cartilage and ligaments. Healthier Nails – Bones also contain gelatin, which can help moisturize your nails and cuticles and allow them to grow and become stronger. How Does Bone Broth Affect Women’s Hormones? Bone broth is loaded with all kinds of beneficial nutrients, including arginine, glutamine, proline, and the amino acid glycine, all of which have an effect on the cells of the body. This also includes the ones for the reproductive system. Since bone broth can also help with gut problems, it’s also useful in helping women because it reduces the inflammation that can decrease their chances of becoming pregnant. It can also affect a woman’s mood, especially in premenstrual and menopausal women. The hormone, osteocalcin, can stabilize mood by alleviating anxiety and slowing the mind down. It also works to regulate the functions of various glands. It may seem like a new thing – a new fad in weight loss diets – to boil and drink bone broth, but it’s not a new thing at all, and it can certainly help your body in many ways. If you’re tired of feeling sick and tired, it may be time to try the Paleo method of boiling bone broth – grass fed cows or free-range chickens – to feel your best.